Ever think about how your favorite cocktail smells? No, you don't. Because cocktails, chilled as they are, rarely carry a scent. Their attractions are primarily tactile and flavor-oriented. This has not stopped ambitious mixologists, however, from endeavoring to have smell play as big a role in drinking as it does in eating. Such was the topic of a seminar held by Pegu Club's Audrey Saunders and beverage director at the French Culinary Institute Dave Arnold, held Nov. 5 as part of a two-day "Alchemy of Taste and Smell" event. Saunders said she got interested in aroma after trying to find a solution to the stink that was given off by egg whites if they sat in a cocktail glass for too long. She discovered that egg whites are great carriers of aroma, and by infusing them with a scent, she solved two problems at once–got rid of the rotten egg smell, and bestowed a far more pleasing odor unto the drink simultaneously. Other items that are good for conveying a scent unto a cocktail: garnishes, Carbon Dioxide (liquid and solid), steam, and fire, as well as Champagne and the good old sugar cube. Suddenly the lovely aroma brought on by the Angostura-soaked sugar cube at the bottom of a Champagne Cocktail makes complete sense. 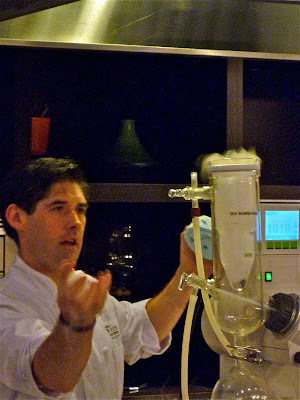 As interesting as Saunders' information was, the highlight of the seminar was the chance to clap eyes on Arnold's rotary evaporator, a contraption—illegal in this country—that bubbles and churns and spins like something out of Dr. Frankenstein's laboratory, and can be used to infuse alcohol with unlikely scents. Arnold placed some Frankincense in a quickly rotating glass bulb, and then fed two bottles of Cognac into the bulb through a long tube. By a process called vacuum distillation or cold distillation (the distillation takes place at lower temperatures than normal), the liquor and Frankincense were heated up and then distilled through dry ice into a clear liquid which smelled of the aromatic gum resin and tasted faintly of the memory of brandy. The idea is such a curious hybrid as this could be used in very specific cocktails. Interesting taste, interesting scent: interesting drink. Arnold then passed around other such experiments, such as Maker's Mark Bourbon invested with the essence of dry roasted peanuts (which tasted and smelled like peanut butter); Cognac redolent of blue cheese; and vodka injected with the smell of cilantro and orange. All very thought-provoking. But of what practical application, I wondered. Adding together in my head the cost of the Frankincense and the two bottles of Cognac—not to mention the use of the roto-vap—I imagined the small amount of resultant distillate to be a very expensive commodity indeed. Even a small fraction used in a cocktail might prove prohibitive. Also, Arnold intimated that these conflations are far from reliable. "These things are good when they're good. You dilute them and they fall apart," he said. He added that the challenge was to make "a drink that a lot of bartenders can make" that would be stabile and consistent.